Mountain Majesty. Oil on Canvas. 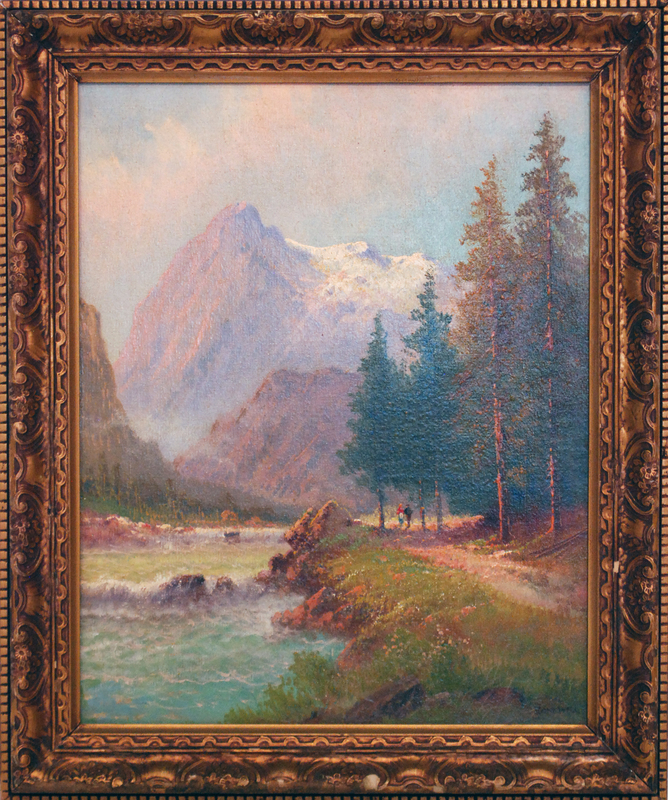 16"x20"
A painter of realistic landscapes reflecting a vanishing wilderness in America, Robert Wood (not to be confused with Robert E. Wood) is reportedly one of the most mass-produced artists in the United States. His painting became so popular he was unable to meet all of the demands, and many of his works were reproduced in lithographs and mass distributed as prints, place mats, and wall murals by companies including Sears, Roebuck. He was born in Sandgate, Kent on the south coast of England near Dover, the son of W.L. Wood, a famous home and church painter who recognized and supported his son's talent. In fact, he forced his son to paint by keeping him inside to paint rather than playing with his friends. At age 12, Wood entered the South Kensington School of Art. As a youth, he came to the United States in 1910, having served in the Royal Army, and he never returned to England. He traveled extensively all over the United States, especially in the West, often in freight cars, and also painted in Mexico and Canada. His itinerant existence took him to Illinois where he worked as a farmhand, to Pensacola, Florida where he married, briefly in Ohio, Seattle, Washington, and Portland, Oregon. In 1912, he was in Los Angeles, and In the late 1920s and early 1930s, in San Antonio, Texas, where he lived and in 1928 exhibited in the "Texas Wildflower Competition." From San Antonio, he gained a national reputation for his strong colored, dramatic paintings. Some of that prestige has been credited to his association with Jose Arpa, prominent Texas artist. Wood also gave art lessons, and one of his students was Porfirio Salinas. During this period, Wood sometimes signed his paintings G. Day or Trebor, which is Robert spelled backwards. In 1941 he went to California and painted numerous desert and mountain landscapes and coastal scenes. He lived in Carmel for seven years, and then moved to Woodstock, New York, but he soon returned to California, settling first in Laguna Beach, then San Diego, and finally in the High Sierras, where he and his wife built a home and studio near Bishop and lived until his death in 1979.